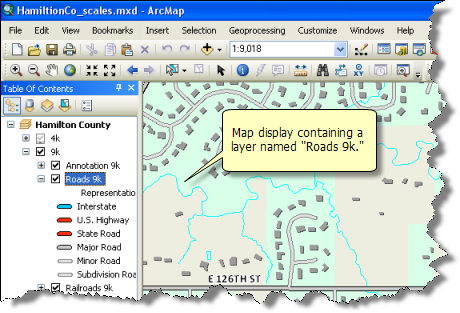 ArcMap represents geographic information as a collection of layers and other elements in a map view. There are two primary map views in ArcMap: the data view and the layout view. The data frame provides a geographic window, or map frame, in which you can display and work with geographic information as a series of map layers. The layout view provides a page view where map elements (such as the data frame, a scale bar, and a map title) are arranged on a page for map printing. When you save a map you have created in ArcMap, it will be saved as a file on disk. 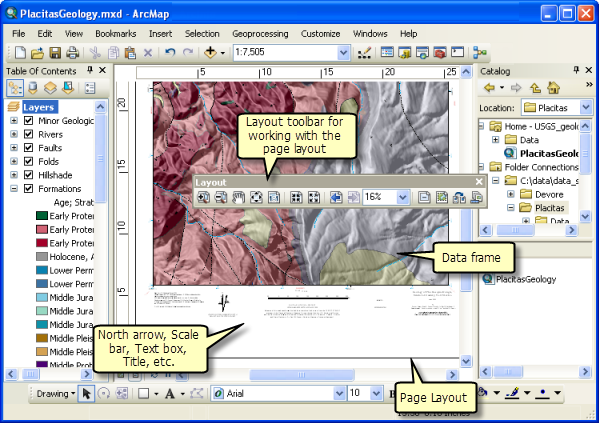 This is an ArcMap document and is referred to as a map document or mxd since the file name extension (.mxd) is automatically appended to your map document name. You can work with an existing .mxd file by double-clicking the document to open it. This will start an ArcMap session for that .mxd file. Map documents contain display properties of the geographic information that you work with in the map—such as the properties and definitions of your map layers, data frames, and the map layout for printing—plus any optional customizations and macros that you add to your map. Each view lets you look at and interact with the map in a specific way. In ArcMap data view, the map is the data frame. The active data frame is presented as a geographic window in which map layers are displayed and used. Within a data frame, you work with GIS information presented through map layers using geographic (real-world) coordinates. These will typically be ground measurements in units such as feet, meters, or measures of latitude-longitude (such as decimal degrees). The data view hides all the map elements on the layout, such as titles, north arrows, and scale bars, and lets you focus on the data in a single data frame, for instance, editing or analysis. When you're preparing your map's layout, you'll want to work with your map in page layout view. A page layout is a collection of map elements (such as a data frame, map title, scale bar, north arrow, and a symbol legend) arranged on a page. Layouts are used for composing maps for printing or export to formats such as Adobe PDF. The Layout view is used to design and author a map for printing, exporting, or publishing. You can manage map elements within the page space (typically, in inches or centimeters), add new map elements, and preview what your map will look like before exporting or printing it. Common map elements include data frames with map layers, scale bars, north arrows, symbol legends, map titles, text, and other graphic elements. Example map layers include streams and lakes, terrain, roads, political boundaries, parcels, building footprints, utility lines, and orthophoto imagery. In addition to representing geographic information, each layer's map symbols, colors, and labels help describe the objects in the map. You can interact with the layers displayed in each data frame to query each feature and see its attributes, perform analytical operations, and to edit and add new features to each dataset. A layer doesn't store the actual geographic data. Instead, it references a dataset, such as a feature class, an image, a grid, and so on. Referencing data in this way allows the layers on a map to automatically reflect the most up-to-date information in your GIS database. In ArcMap, you specify properties for each map layer, such as its map symbols and labeling rules, by right-clicking the layer in the table of contents and clicking Properties or by double-clicking on the layer name. The Table of Contents lists all the layers on the map and shows what the features in each layer represent. The check box next to each layer indicates whether its display is currently turned on or off. The order of layers within the Table of Contents specifies their drawing order in the data frame. 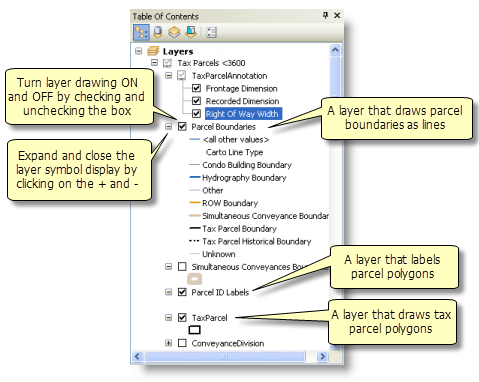 The map's Table of Contents helps you manage the display order of map layers and symbol assignment, as well as to set the display and other properties of each map layer. A typical map might have an image or a terrain base (such as shaded relief or elevation contours) near the bottom. Above that layer are basemap polygon features, line and point features, and then annotation and other reference information. A page layout is the arrangement of map elements and their overall design on a printed page or a digital map display. 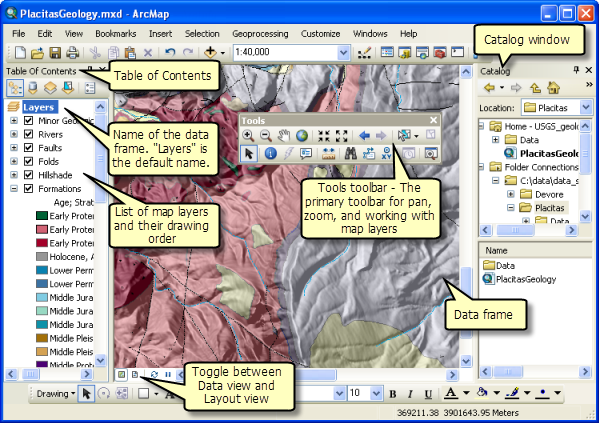 It is one of the primary display views that you work with in ArcMap—primarily to create maps for printing or for export and sharing using PDF. Example map elements include a title, legend, north arrow, scale bar, and a data frame. You can have more than one data frame in a map. This is often useful for map pages that contain multiple windows in your layouts (for example, to include a locator or index map that references the location of the primary data frame). When you save a map you have created in ArcMap, it will be saved as a file on disk. A file name extension (.mxd) will be automatically appended to your map document name. In later sessions, you can work with an existing .mxd file by double-clicking the document to open it. This will start an ArcMap session for that .mxd file. ArcMap, ArcGlobe, and ArcScene include a Catalog that is used to organize and manage various types of geographic information as logical collections—for example, the data, maps, and results of your current GIS projects that you work with in ArcGIS. 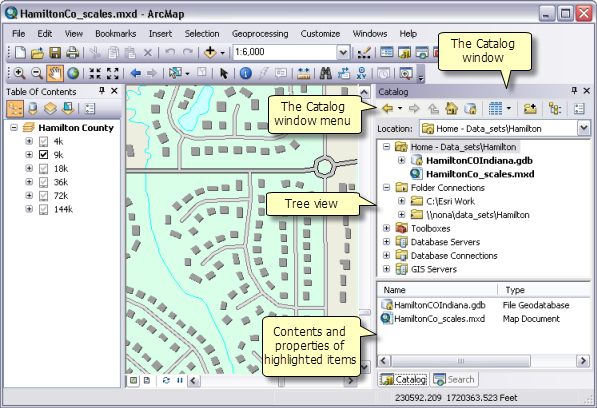 The Catalog provides a tree view of file folders and geodatabases. 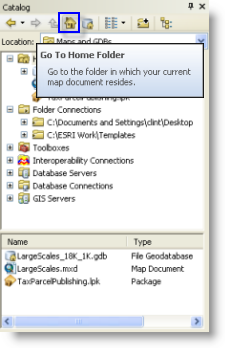 File folders are used to organize your ArcGIS documents and files. Geodatabases are used to organize your GIS datasets. One of the key workspaces in ArcMap is each map document's home folder, which is the folder location where your map document is stored. The Home folder is used by default in ArcMap to save results, store new datasets, and to access file-based information. Each map document has a default geodatabase, which is the home location for the spatial content of your map. This location is used for adding datasets and for saving resulting datasets created by various editing and geoprocessing operations. 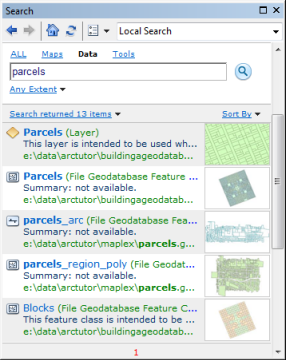 ArcGIS includes the ability to search for GIS content and to put it work quickly—for example, by adding a search result to your map or by inserting a result item into a geoprocessing operation.